It is important to know what foods your rabbit can and can’t eat. Your pets rely on you to provide them with nutritious food and to keep them healthy. When most people imagine a rabbit eating, they image it enjoying fresh vegetables. It is a common belief that pet rabbits can live off a diet made up of salad. 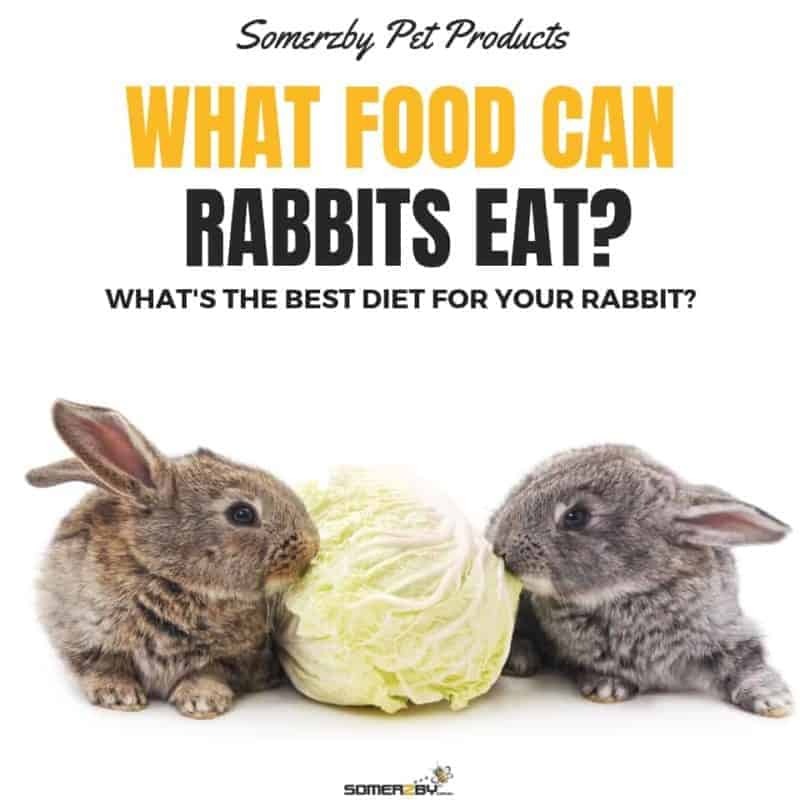 Rabbits actually require a balanced diet made up of many different components, with vegetables making up a small portion of their diet overall. But can rabbits eat celery, cucumber, watermelon, lettuce, can they eat spinach? 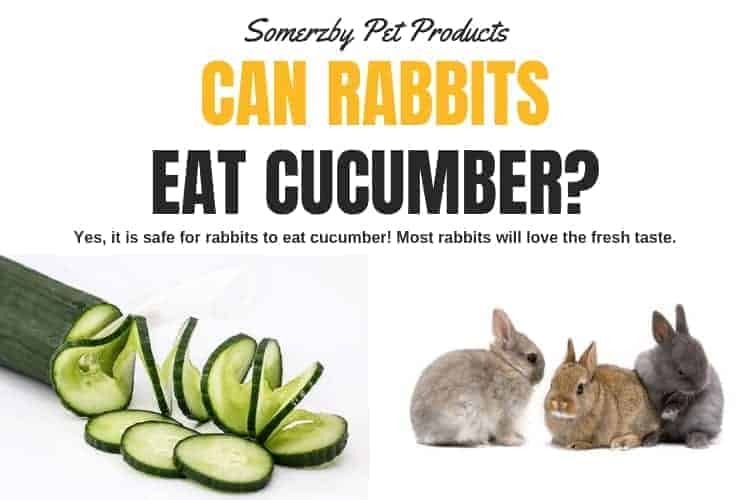 Yes, it is safe for rabbits to eat cucumber! Most rabbits will love the fresh taste. Rabbits can also eat cucumber leaves. Before feeding cucumber to your rabbit, wash it in cold water to remove pesticides. If you can, choose organically grown cucumbers. Only ever give your rabbit a few small pieces of cucumber at a time. Cucumber is made up of 95% water. Feeding your rabbit cucumber can be a great way to help give it a boost of hydration, especially in hot weather or if your rabbit doesn’t drink enough water. Cucumber is low in kilojoules so it makes a great treat for rabbits, as they are prone to obesity. The skin is the healthiest part of the cucumber as it is highest in fibre. Otherwise, cucumbers have no real nutritional benefit. Cucumber is low in nutrients. Therefore, feeding it too often risks filling up your rabbit without providing any significant nutritional value. Due to its high water content, cucumber can cause your rabbit to have diarrhea. If your rabbit produces loose cecotropes (the type of poo rabbits will eat) then they will be more difficult to consume. Rabbits rely on eating cecotropes to get many of their nutrients, including vitamin B. Therefore, diarrhea can lead to malnutrition. Only ever feed your rabbit small amounts of cucumber at a time. If cucumber causes gas or diarrhea, don’t feed it to your rabbit anymore. Yes, rabbits can eat celery! It can be included as part of their balanced diet. Remember, giving your rabbit a variety of different vegetables will make it as healthy as possible. Most rabbits will enjoy eating celery. It is sweet enough to taste great without being full of excess sugar. Only ever give your bunny raw celery, never cooked celery. Rabbits cannot digest cooked vegetables properly. Plus, the crunch of raw celery is both enjoyable for your rabbit and great for its teeth. Rabbits can also eat the leaves of the celery plant. Sometimes, the leaves are even more nutritious than the rest! In regards to amount, celery should be included in the small amount of mixed vegetables you give your rabbit daily. When giving your rabbit celery for the first time, introduce it slowly with very small amounts at first. Celery is very healthy for your rabbit. It is a good source of various vitamins and minerals including vitamins B, C and potassium. The indigestible fibre in celery will help keep your rabbit’s digestion healthy and regular. Eating celery can also keep your rabbit hydrated. Its high water content will help keep your rabbit’s fluid levels up. This is especially beneficial if your rabbit doesn’t drink enough water. 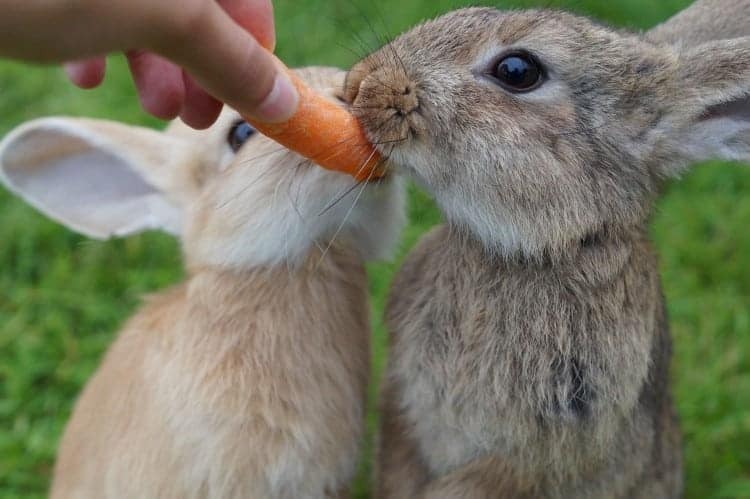 Chewing on crunchy celery also helps to wear down your rabbit’s ever-growing teeth. 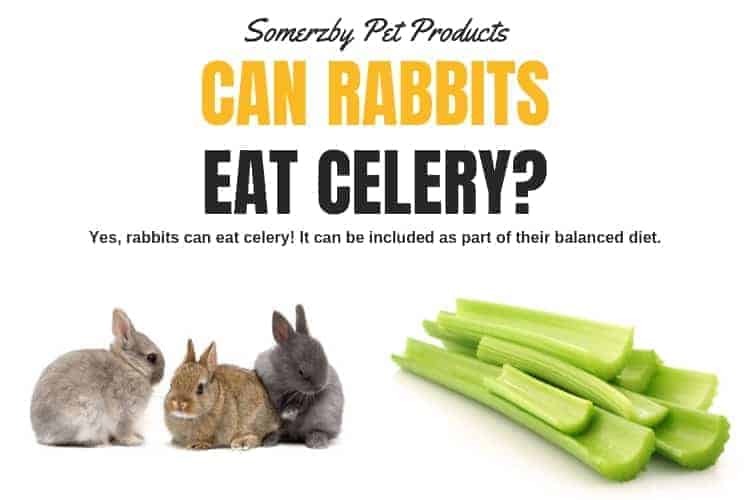 Introduce celery into your rabbits’ diet slowly and only feed celery in moderation. Too much celery can cause digestive upset and diarrhoea. If this occurs, stop feeding your rabbit celery. Rabbits can have sensitive digestive tracks and some individual bunnies just aren’t suited for certain vegetables. The stringy parts of celery can get stuck in your rabbits’ teeth, just like they do in human teeth. Similarly, these long strands can get caught in your rabbit’s throat and be uncomfortable or even become a choking risk. To avoid this, always cut up the celery into small pieces. Shorter strands are less of a threat. The smaller the better but at least cut it up into pieces no longer than 2cm. The leaves are not a choke risk and are safer. Yes, adult rabbits can safely eat watermelon in small quantities. Most rabbits will love the sweet and refreshing taste. Never feed baby rabbits fruit. Watermelon can be fed as a treat once or twice per week. Each serving should be no more than one tablespoon. Less is more! Always feed ripe watermelon. It is safer to feed unripened watermelon, rather than wilted watermelon. Rabbits can eat the watermelon rind. It is actually healthier for your bunny than the flesh. Make sure you cut it up into small parts as it can be quite tough. Rabbits cannot eat watermelon seeds. Always cut up watermelon into small pieces and remove any seeds. If possible, buy seedless watermelon. 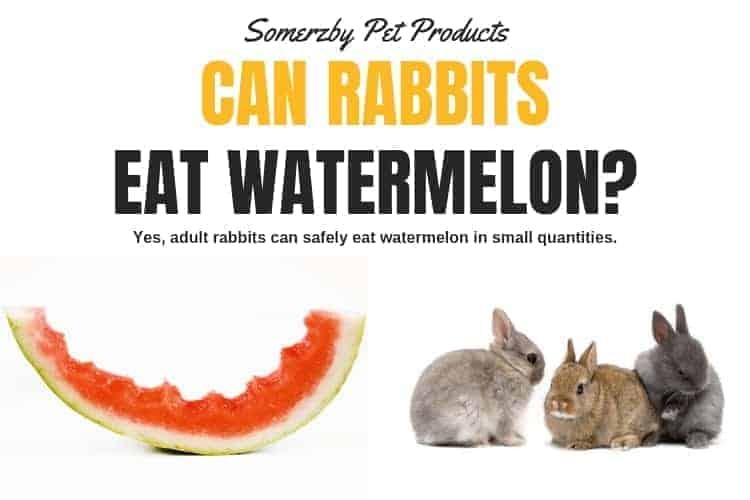 Watermelon is high in water and can help keep your rabbit hydrated on warmer days. It is also high in vitamins A, C, magnesium and choline. Choline helps improve your rabbits sleep and muscle movement. The healthiest part of the watermelon is the rind. It is higher in fibre and lower in sugar. Watermelon is very high in sugar. Rabbits cannot break down these sugars naturally. Whilst fine in small doses, too much sugar will cause digestive upset and diarrhea. Seeds can obstruct your rabbits’ intestines. They cannot chew them properly or regurgitate. Always remove seeds! Similar to humans, rabbits can develop a sweet tooth if fed sugar regularly. If you feed it sweet fruits daily, it may start to refuse necessary foods such as hay or pellets. Watermelon juice can also be quite sticky. If your rabbit gets watermelon juice on its fur, it will stick together. You will then need to give it a bath or, at least, spot clean his fur. Give your rabbit bit sized pieces and check its fur after eating. Yes, they can! Spinach is healthy for both you and your rabbit. You can buy a big bunch for yourself and share the leftovers with your pet. Spinach should be given to your rabbit fresh. Never give it spinach that has gone bad (wilted, smelly and slimy). This could give your rabbit a bacterial infection. Always feed your rabbit raw spinach. Never give it cooked spinach. They are incapable for digesting cooked food properly. Wash the spinach before feeding it to your rabbit. This will clean off dirt as well as harmful pesticides. Rabbits can be very sensitive to chemicals. Organic spinach can be a great option for your pet bunny. It has had less exposure to pesticides and can be higher in nutrients. If spinach is a new food for your rabbit, introduce it gradually to minimise diarrhoea or digestive upsets. Give it a small amount, wait 24 hours and see if it processes soft poo. If it does, do not continue feeding it spinach. If it doesn’t, give it very small amounts for 2-3 weeks. Then you can feed normally. Spinach is a super food! It is full of essential vitamins and minerals which benefit both you and your long-eared friend. It is high in Vitamin A, which is essential for healthy rabbit growth. It is also a great source of Vitamins C, E and K and the minerals Calcium, Iron, Folic Acid, Magnesium and Potassium. The spinach’s stems and stalks are the healthiest parts. They are higher in fibre. The spinach leaves are also very nutritious. The roots are highest in sugar (as this is where the spinach plant stores its energy) so better to not feed them to your rabbit. For the healthiest bunny possible, feed it a well-rounded diet with plenty of different fresh, leafy greens. Healthy vegetables include broccoli, celery, carrot tops, bok choy and dark leafed lettuce varieties. Herbs rabbits enjoy include parsley, oregano, coriander, basil, dill and mint. Rabbits should be fed spinach in moderation. It is best to feed it spinach once per week but no more than twice per week. Spinach should be given as part of a balanced diet with a variety of fresh produce, grass hay and pellets. Variety is essential. If you feed your rabbit too much spinach, it can make it unwell. Spinach is high in oxalic acid. Oxalic acid is a naturally occurring toxin that is fine in small amounts. However, if eaten in excess, oxalic acid will bind together minerals and make them insoluble. This includes magnesium and calcium. This can cause itchy skin, urinal tract issues and life-threatening bladder stones. Spinach itself is also very high in calcium. Excess calcium can cause kidney issues. Don’t let these risks turn you off feeding your rabbit spinach! The health benefits are definitely worth making spinach part of your rabbits’ diet. Just make sure you feed it in moderation. Rabbits can eat lettuce. However, a rabbit’s diet should never be primarily based around lettuce. Any lettuce given to your rabbit should be given in moderation as part of their vegetable intake. Large amounts of lettuce can cause digestive problems and overall health issues for your rabbit. Some lettuces are better than others. You should not feed your pet rabbit light coloured and watery lettuces, such as iceberg lettuce. Iceberg lettuce has very little nutritional value. This means your rabbit may fill up on it but not get the nutrients or kilojoules it needs. Iceberg lettuce commonly leads to diarrhoea in rabbits which, if bad enough, can be fatal. 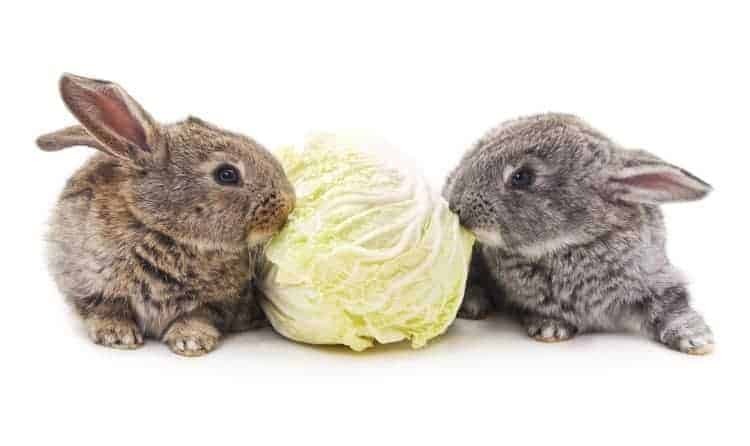 Some vets also claim iceberg lettuce can be harmful to pet rabbits in large quantities. It contains a compound called lactucarium. This is a milky fluid secreted from lettuce stems. Some argue lactucarium can have a sedative effect on your rabbit and cause health issues. You can feed your pet rabbit darker and leafier types of lettuce. This includes cos (aka. romaine), loose leaf and butterhead lettuce. These contain more nutritional value including vitamins A, C, K and fibre. They can also eat dark, leafy salad greens such as rocket or spinach. Whilst rabbits love to eat leafy greens, there are many foods that are much more nutritional for your pet rabbit than lettuce. A rabbit’s diet should be mostly grass based. You should provide your pet rabbit with an unlimited supply of fresh grass hay (including timothy and meadow hays). This will assist your rabbit’s digestive health as well as helping to wear down its teeth. Pet rabbits should be fed around one cup of vegetables each day, depending on the rabbit’s size and body weight. It is best to include an assortment of vegetables (including lettuce). This will give your rabbit a wider variety of nutrients as well as assorted tastes to enjoy. The best vegetables for your pet rabbit are bok choy, basil, celery, capsicum, carrot tops, brussels sprouts, broccolini and parsley. Only ever feed your rabbit raw, uncooked vegetables, not cooked ones. It is widely debated (and undecided by many) if it is okay to feed your rabbit kale or not. Some believe that kale contains high levels of oxalic acid. This is a naturally occurring poison produced by plants as a form of defence. It is also healthy for your pet rabbit to regularly eat small amounts of high quality and fibrous pellets. Fruit can be given to your pet rabbit occasionally as a treat. Note that fruit has a high sugar content and should not be given regularly. Rabbits love strawberries, bananas and apples (careful to avoid seeds!). Always provide your pet rabbit with a constant source of clean water. Never ever feed your pet rabbit avocado, chilli, potato, onion, coconut or cabbage. If in doubt whether you can or can’t feed your pet rabbit something, don’t. Rabbits will eat almost anything offered to them so it is up to you to decide what is and is not okay for them. Tomatoes are a fruit, and fruit should only ever be a treat for pet rabbits. You can feed your rabbit one slice of tomato, or one small cherry tomato, once per week. Tomatoes can make a great training tool. Gently hand feed your bunny tomato pieces to help bonding. You can give your rabbit red or yellow tomatoes. They should be raw (not cooked or canned) and ripe (not rotten). Always wash tomatoes before giving to your rabbit, to clean and remove pesticides. Cut the tomato into small pieces and remove all seeds. Do not feed your rabbit green tomatoes or parts of the tomato plant (including leaves, stems, vines and flowers). These can be toxic. Never give fruit to baby rabbits. Tomatoes provide some nutrition for rabbits. They are high in Vitamins A, B6 and C. They are also high in potassium and antioxidants. However, rabbits should get the majority of their nutrition from other sources. Eating too much tomato can make your rabbit feel unwell. The high level of sugar and acidity in tomatoes can increase the growth of bad bacteria in your rabbit’s gut. This can lead to painful bloating or diarrhea. Eating tomatoes too regularly can cause your rabbit to gain excess weight. Green tomatoes plus tomato leaves, stems, vines and flowers can be poisonous for rabbits. They contain solanine and tomatine, which can irritate your rabbit’s digestive system and lead to death. Avoid feeding any of these to your rabbit. Tomatoes are also very juicy and messy, and the juice can get stuck in your rabbit’s fur. Always check and clean your rabbit after feeding messy fruits. White and red grapes can be fed to your rabbit as a treat, on occasion. Most rabbits will love the sweet taste. They are a great treat to use for training and bonding. Feed your rabbit fresh (not dried) grapes that have been washed. Only ever feed one or two grapes a week, cut into small pieces. Remove seeds and the skin. Whilst the skin is edible, too much of it can lead to kidney issues. Grapes contain a lot of water and can help to keep your rabbit hydrated. Studies have shown rabbits that consume grapes have healthier hearts. Grapes contain vitamin C, B6 and potassium. However, your rabbit should get most of its nutrients from other sources. Grapes are high in sugar. Eating too much sugar can lead to obesity in rabbits. It can also be digested too quickly and cause painful gas and bloating. Eating too many grapes can change the acidity level in your rabbit’s stomach and prevent the growth of good bacteria. It is debated that excess grapes can lead to kidney issues in rabbits. Always feed in moderation. Grapes have a particularly high level of pesticide residue, compared to other fruit and vegetables. Always buy organic, if possible. Wash and soak grapes in water thoroughly before feeding to your rabbit. Whether rabbits can eat corn or not is a debated topic. Corn is not toxic to rabbits so technically they can eat it. However, it is extremely hard to digest and can cause digestive issues. For some rabbits, these issues are instant. For others, they can build up over time. It is safest to avoid feeding corn to your rabbit completely. There are many other healthier vegetables you can feed your rabbit that have more benefits and no risks. Corn has no real nutritional benefit for rabbits. It just fills them up. All parts of corn are difficult for rabbits to digest, especially the hard-outer layer of the kernels. Rabbits will often swallow their food without enough chewing. The corn then won’t break down during digestion. Undigested food can remain inside the rabbit’s intestines and can cause intestinal blockages, wounds and diseases such as gastrointestinal stasis (where digestion slows or stops completely). Corn is too high in starch, sugar and carbs to be healthy for rabbits. Stringy corn husks can get caught in your bunny’s teeth and windpipe, causing pain and possible choking. Rabbits can eat all parts of the cauliflower. This includes florets, leaves and stems. The leaves are the healthiest part. You can feed your rabbit a few cauliflower leaves several times a week, as part of their daily mixed leafy greens. Cauliflower florets and stems can be fed as a treat. Feed your rabbit a few teaspoons of cauliflower florets and stems occasionally. Lots of rabbits do not enjoy the taste of cauliflower. It is not an essential vegetable. If they don’t like it, no need to force it. Cauliflower is high in fibre, which rabbits require to keep their digestive system healthy. Fibre also makes your rabbit feel full after a meal. This, along with the fact cauliflower is low in kilojoules, helps prevent your pet rabbit from obesity. Cauliflower is also a good source of vitamin C, protein and potassium. Feeding your pet rabbit any vegetable in excess can upset its digestive system and leave it feeling unwell. Feeding it too much cauliflower can lead to painful bloating, gas and diarrhea. Introduce new vegetables to your rabbit slowly and feed in moderation. 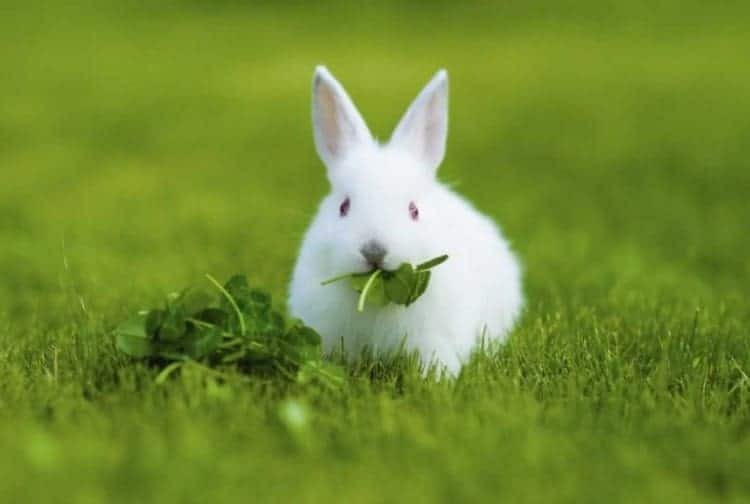 When feeding your pet rabbit lettuce (or any new food) for the first time, always introduce it gradually in small amounts. This can help prevent digestion issues. Rabbits are all unique and some cannot tolerate food that others may be able to. If your rabbit produces soft poo 24 hours after you first give it the new lettuce, it is a sign that it is not suitable for your pet. This entry was posted in Rabbits and tagged carrots, eating, foods, lettuce, nutrition, rabbits, spinach.